USER SCORE:64%The percentage of users who liked this based on high quality reviews from sources such as Google Play, iTunes, and Amazon Music. Above 75% is green. ? 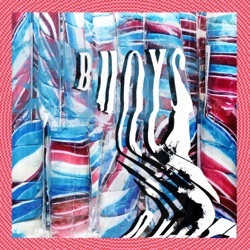 Buoys is the sixth studio album by Panda Bear, released by Domino Recording Co on February 8, 2019. It’s otherworldly, yet familiar and experimental, but grounded—just a more mellow experience all around this time. Most of Buoys is restricted rather than liberated by his minimalistic approach. A disappointment, considering the breadth of energy and color found in Panda Bear’s solo work and his more adventurous outings with Animal Collective. The nine tracks that comprise Buoys are disarmingly straightforward, a rare glimpse into the unaltered state of Lennox. The guitar drones driving the tracks sound monotonous over time. A minimal, well thought-out piece of work. The lion's share of Buoys is shaped by monotonous and repetitive strumming, low-profile vocals and outright mediocre songs. It’s the sound of one person considering his place in the world, beamed to a person who, in turn, considers their own. No song reaches the five-minute mark, and each one is a familiar, easily digestible version of the type of watery, Brian Wilson-esque psych-pop Panda Bear’s been crafting since Person Pitch. A few sonic techniques of the album do eventually begin to bleed together and overlap, but the shapeless whimsy mostly feels charming, hypnotic even. For the most part, it’s a good look on him. The relatively trim Buoys winds up feeling as minor as 2018’s A Day With the Homies EP, despite being twice as long and bearing far higher expectations. Try as he may to embrace external influences, Panda Bear remains inescapably himself. Even for a someone who has spent the best part of two decades making lysergic-dappled, experimental pop in his very own vision, the sixth Panda Bear album feels like a bold leap into unfathomed depths. If the album is the least immediately rewarding of Panda Bear’s solo career, it nonetheless reveals copious merits upon repeat engagement. There’s an indelible beauty contained within, and the surface need only be scratched a little to find it. Old, but new at the same time, the seemingly limited palette of ‘Buoys’ is single minded and direct. A stunning, if hushed, indirect hit. His sixth solo album is remarkably more muted than his previous work. The stylistically narrow, single-mindedly “hyper-futuristic” confines of Buoys only serve to emphasise his ever-diminishing role as a figurehead for alternative music. Listening to Buoys, it's hard not to miss what Philip Sherburne once called the "ecstatic excess" of Lennox's music. While a real buoy may be subject to some pretty heavy waves, Buoys is a fairly calm listening experience. Buoys is Panda Bear’s most stark and minimal album since 2004’s Young Prayer, his ascetic, aching paean to his recently departed father. A trip through cyclical, recurring beats, water-based sampling and dreamy vocals that never make much sense. Adjusting to ever-changing conditions, it appears this Panda may just thrive in his new habitat. Majestic and beautiful, its nine soothing songs include frequent use of Auto-Tune and fling the door wide open in terms of what could come next for both himself and Animal Collective. Even with a practically unrivaled discography under his belt, Buoys might be his most revealing record. Repositioned between the classics of the genre, the recordings of Animal Collective and current electronics. In a way, its title does give the album justice, as it is a Buoy of its own in the musician’s catalogue; and like any buoy, it’s designed to stand out. Experiment with the ways you listen to it and Buoys can either flicker like a candle or explode like a firework. Buoys requires repeat listens to appreciate fully, but those willing to dive deep enough will surely be rewarded. Where there’s a proportion of indie fans looking to artists like Panda Bear to keep the critical home fires burning, he’s managed to do it this time underwater. With a few gems and a lot of redundant writing however, this will definitely be a Panda Bear album just for the fans. Buoys finds the celebrated artist exploring greater depths than ever before. Here, Lennox updates that balance struck between squelchy abstraction and clarity, which is - in the main - an immersive experience. A fruitful addition to Lennox's one-of-a-kind audial metamorphism. Panda Bear has opened another insight into his soul. He’s left us no clearer, but emotionally fulfilled. "Buoys" knows best to please, if you break away from every expectation and hide the big name behind it. Listeners will see more that connects it back to Person Pitch: its warm and summery sound, its acoustic elements and vocal harmonies, and the presence of collaborator/producer Rusty Santos. Lennox’s sparsest music since Young Prayer and the early days of Animal Collective, Buoys is an immersive wonder. It’s a pleasant enough album but not likely to bring a legion of new fans or be singled out as one of his best. Buoys may not mark a major departure in Panda Bear’s sound, but it bristles with the creative energy of an artist confronting his deepest, most destructive demons.